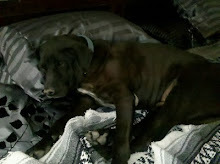 And this is my newest distraction. Prairie Schooler "Thanksgiving Comes Again". 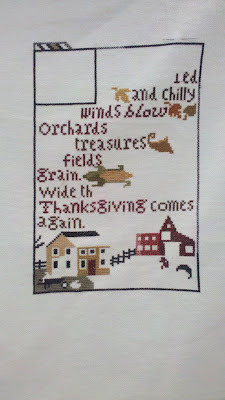 I ordered this off of Ebay, thinking it would be nice to work on around Thanksgiving time since I like to stitch in season. Well, when I got the chart the colors were just too pretty to resist. I think i'm about halfway through already? The rest of my time this week is being spent back to school shopping. My youngest starts kindergarten this year. The school she is going to requires uniforms, and they have to have all white sneakers. For my oldest it was no problem finding all white sneakers, but my youngest still wears toddler sizes. Do you know how hard it is to find all white little girl toddler shoes! I went to every shoe store in town before ordering them on line. Now i'm a little nervous for when they get here if they are even going to fit. If all else fails my youngest may be wearing a home-made pair of sneakers for her first day of school. Yes, this is honestly how I get most of my stitching done at home. Karma, our pet conure likes to sit with us on the couch while we watch tv. Well, I more listen to the tv as most of the time I am stitching if i'm sitting. Karma actually loves to help me stitch, she pulls the needle through the top of the fabric, and occasionally refuses to give it back. 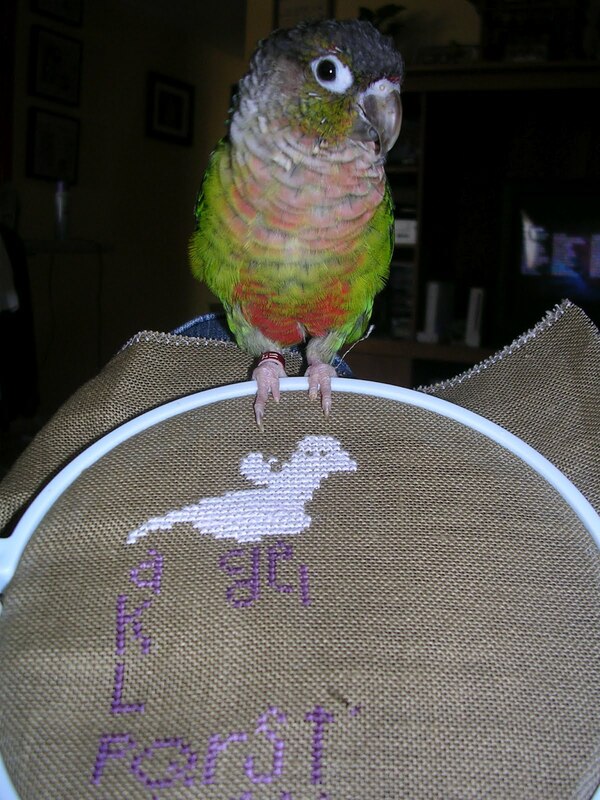 If she sees me sitting and stitching, and I haven't taken her out of her cage she will squawk and call to me until I do. She has never bird-pooped on one of my stitching pieces yet (we have semi-trained her to do it before we take her out of her cage) but I am a little fearful someday she might. Anyway, it is fun to have a pet that enjoys my little hobby as much as I do. And this is my little finish for the week. Bent Creek's "Boo", I left out the little star in the upper left corner in favor of the cute spider web charm in the bottom right. It only took me three days to whip up. I know, I know! those three days would have been much better spent working on one of my Crazy January pieces, but I am easily distracted by anything Halloween. And with temps hovering around 110 degrees here I am longing for cooler Autumn weather. It took me quite a few photos to get the color on this one to look like it does in real life. I finally had to give up on ever getting the line perfectly straight in the photo. The linen is a very pretty buttery-beige color. 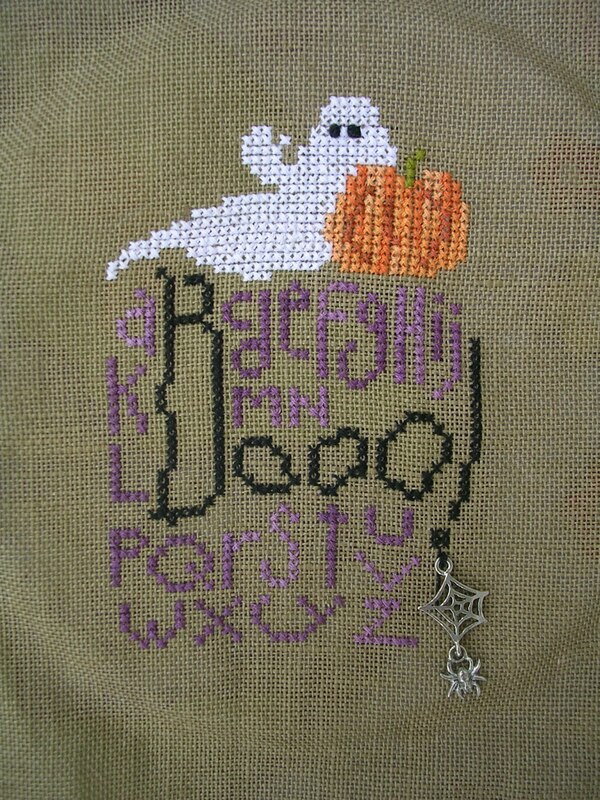 This was the one piece I started as soon as I got the chart on our vacation. Dixie Darlin has a finished model of this one, and it was gorgeous. 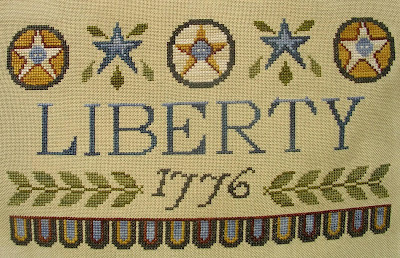 The chart is "1776" by Little House Needleworks. It took me all of 2 weeks to stitch this one. I was under the self-imposed dead line of having it done for the 4th of July. 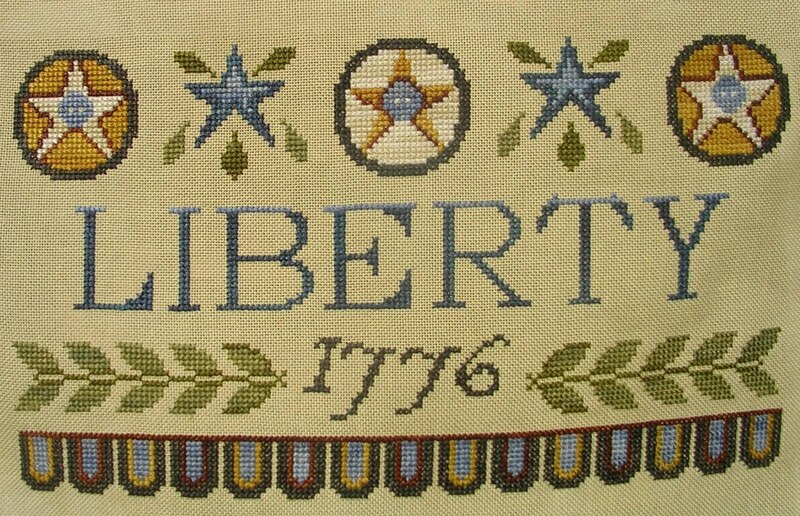 I got it done on the 2nd, and fingers crossed will have it framed for the 4th of July 2013! I hope everyone enjoyed the 4th of July. We watched the fireworks from our back porch. One of our dogs took off as soon as the noise started, but the other one actually laid at our feet and seemed to enjoy the show, he was definitely looking up at the fireworks. It was funny to watch. Luckily enough we had the first monsoon storm here yesterday, and it sprinkled rain most of the day (it only rains here a handful of time every year). Lucky for two reasons, it probably made it safer for the fireworks here in the very dry desert, and because our air conditioning went out Tuesday night! It was fixed by yesterday afternoon, and the rain cooled it down to about 90 yesterday when our normal temps here are around 110. So I was very grateful for our semi-annual dose of rain. 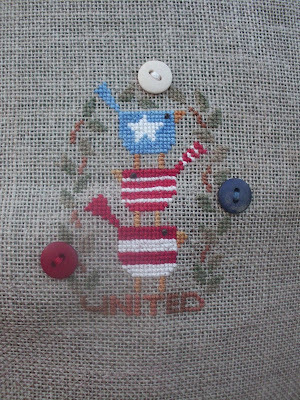 I'll end with another patriotic piece. 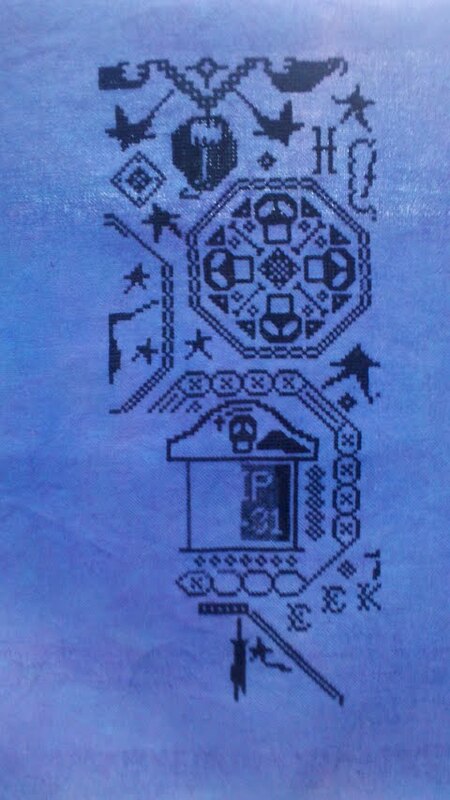 This is the Bent Creek zipper kit I finished on the plane ride back from summer vacation. 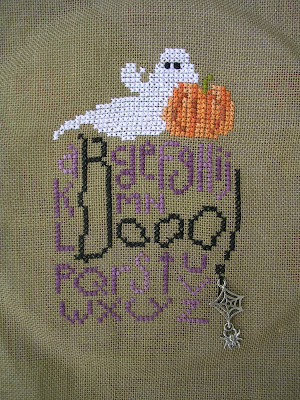 I stitched it using Weeks thread instead of the Perl cottons included in the kit. So far I can't force myself to stitch with those, they seem so bulky. 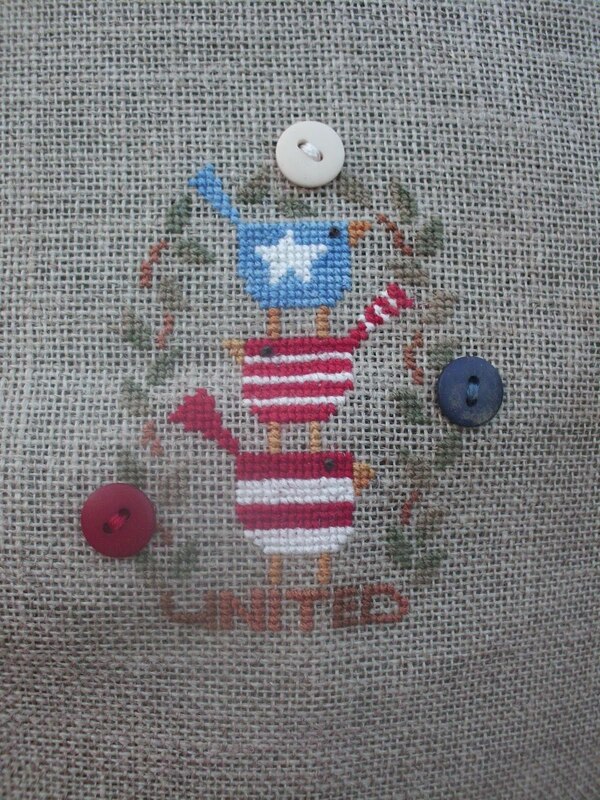 So this turned out much smaller than it would have, but still a cute patriotic finish.